Goodreads says, "A troubled teen, living in Paris, is torn between two boys, one of whom encourages her to embrace life, while the other—dark, dangerous, and attractive—urges her to embrace her fatal flaws. 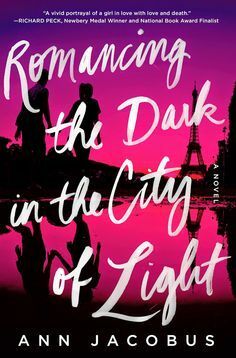 Haunting and beautifully written, with a sharp and distinctive voice that could belong only to this character, Romancing the Dark in the City of Light is an unforgettable young adult novel. Summer Barnes just moved to Paris to repeat her senior year of high school. After being kicked out of four boarding schools, she has to get on track or she risks losing her hefty inheritance. Summer is convinced that meeting the right guy will solve everything. She meets two. Moony, a classmate, is recovering against all odds from a serious car accident, and he encourages Summer to embrace life despite how hard it can be to make it through even one day. But when Summer meets Kurt, a hot, mysterious older man who she just can't shake, he leads her through the creepy underbelly of the city-and way out of her depth. When Summer's behavior manages to alienate everyone, even Moony, she's forced to decide if a life so difficult is worth living. With an ending that'll surprise even the most seasoned reader, Romancing the Dark in the City of Light is an unputdownable and utterly compelling novel." My Thoughts: I got about 25% through the book and at first it seemed promising. I mean a girl finding her way in Paris and attending school there....magical, right? But then I realized I despised the main character. She seemed too much of an anti-hero for me and she was complaining that she wasn't going to get her trust fund. All she needed to do to acquire the trust fund was simply graduate high school and attend a university by the time she was 22. That's it. But you would have thought they asked for her first born child. Plus, she was really, really troubled. I just wasn't feeling it, because I am currently lacking sympathy for white girls of privilege that self-sabotage their lives and have absentee parents. So, what do you think? Have you read this book? 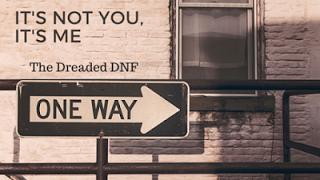 What's the last book you DNF? I had such high hopes for this one too! Argh! The MC sounds like hard work! Yeah, I just couldn't do it! Thanks for visiting, Leanna! Yeah, I have noticed that as well, Jenny. A lot more YA books are disappointing me. I am not sure why that is. I'm glad it is not just me. Thanks for visiting. I haven't read this one yet but I've heard some mixed things. I want to give it a try but I'm not sure about that main character. Thanks for the honest thoughts. Yeah, I've seen some mixed reviews as well. If you do read it, I'll keep my eye out for your full review. Thanks for visiting, Katie! Hope you find something better to read next! Haha- you are so right, Christina! I did find something better. I am currently reading Jennifer Donnelly's These Shallow Graves and really enjoying it! Thanks for visiting! Yea, it sounds like my eyes might fall out of my head at the amount of eye rolling this one would require lol. I am not a fan of whiny spoiled characters. My most recent DNF was Dreamstrider, sadly. It did sound really interesting, but after about 30 pages in I was so bored. Struggled to page 75 before bailing. Haha. YES! I just couldn't connect with the main character. And regarding Dreamstrider...it's a bummer when a book doesn't work for you. Not every book can be five stars, right? Thanks for visiting, Becky! Gah. I wish I'd read your review of this before I picked it up. Sigh. Well, maybe you'll enjoy this one more than me. I will keep my eye out for your thoughts. Thanks for visiting, Joy! I snagged this one...but I have to admit that after reading the synopsis for the second time I decided it really didn't sound like something I would enjoy. Sounds like I was right. Hope the next one is better. Yeah, I wish I would have really focused in on the synopsis before I read the novel. It would have saved me a lot of time. Thanks for visiting, Natalie!